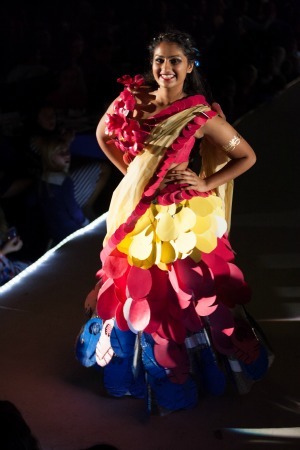 Charlottesville, VA, Nov. 10, 2015 – From Greenberry's Coffee to the Blue Ridge Mountains, The Paramount Theater to Thomas Jefferson's Monticello, iconic sites and cultural representations of Charlottesville were brought to life in St. Anne's-Belfield School's tenth annual Wearable Art Runway Show. "This year we wanted to travel back to where it all started," said Alexis Parker, instructor of the School's Art Constructions class. "Each garment represents an aspect of or location within Charlottesville, and we are very grateful for community organizations that donated materials with which our students could work." Each suit or dress in the show, 39 this year made by 34 students, is composed entirely of non-fabric items. Leaves, paint chips, egg crates, shopping bags, even University of Virginia football tickets were used to construct works of art that were modeled live. This year's show also featured accessories made by the School's Learning Village students, those in kindergarten through eighth grade. "Local businesses were so generous to us," said Parker. "We've received donations from Greenberry's, Foods of All Nations, Kate Spade, King Family Vineyards, and many more so that our students could construct their art from materials other than fabric." Senior Berkeley Hoerr created five garments this year, four made of dyed packing paper and inspired by the seasons of the Blue Ridge Mountains as well as one dress constructed of hardware store materials. "I enjoy everything about the show," said Hoerr. "I love coming up with the ideas, making the dresses, and I think doing the hair and make up for the show is amazing. I will miss having the opportunity to create crazy wearable works of art every year and the bond that develops between the designers." The runway show was a part of the School's annual Fine Arts Dinner with performances by a cappella groups TrebleMakers and Elements of Sound, as well as the Philharmonic and Counterpoints strings ensembles. The encore show included a Sweet Treats dessert party and a performance by Counterpoints. Both events were hosted by the School's fine arts boosters. Photo courtesy of David Jones.